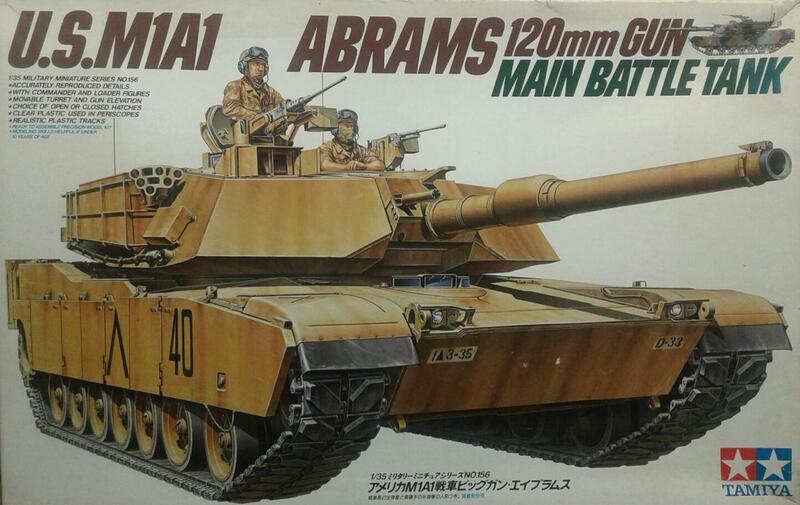 U.S. M1A1 ABRAMS 120mm GUN MAIN BATTLE TANK.The first M1 tank was delivered to the U.S. Army in February 1980, and was officially named and christened the "Abrams" by the widow of the late General Creighton Abrams. This new Abrams tank benefited from the latest technological wonders of the time, giving it enormous advantage on any battlefield. The turret, being very angular and squat, had a very roomy interior. This angular design was combined with Chobham armor for excellent protection against the kinetic energy from hollow charge projectiles. The hull sides and rear panels are vertical, with only the front angled to deflect anti-tank shots. The 1500 horsepower Avco-Lycoming AGT-1500 turbine engine provides remarkable speed and maneuverability plus being regarded as one of the quietest tank powerplants available today. During the mid 1980's the M1 underwent an improvement program to upgrade the 105mm gun to the type M256 120mm smoothbore cannon. The armor at the frontal area of the lower hull front and turret was also increased, and it was given the new designation of "M1A1." Other improvements are seen in the enlarged rear turret bustle stowage rack, a new style crosswind sensor, a revised gunner's sight mount, plus reinforced suspension and transmission unit. Both the M1 and M1A1 Abrams were deployed during the Persian Gulf Conflict and they demonstrated outstanding performance and combat success.